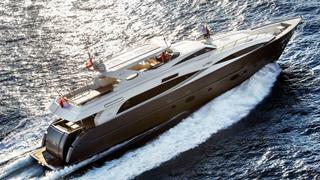 The 35.8 metre motor yacht Aliyoni has been listed for sale by Nautique Yachting in Turkey. Designed by New Zealand’s Warwick Yacht Design, Aliyoni was built in carbon re-inforced composite by Turkish yard Alia Yachts to RINA class and delivered in 2012, Accommodation is for up to 12 guests in five cabins consisting of a full-beam master suite on the main deck, two VIP suites and two twins, all with entertainment centres, satellite television screens and en-suite bathroom facilities. A further three cabins sleep four crewmembers aboard this yacht for sale. The extensive galley forward to port is directly connected to the full-beam dining area, main saloon and aft main deck, offering several entertaining and dining locations, both inside and outdoors. Her spacious flybridge hosts a second helm station and comes complete with a bar and barbecue facility with seating for up to ten guests and four sunbeds, with shade provided by a hard top. Built for speed as well as comfort, a pair of 2,600hp MTU diesel engines propel her planing hull to a maximum speed of 28 knots, and she cruises comfortably at 20 knots. Lying in Istanbul, Turkey, Aliyoni is asking €4,650,000.